I'm trying to bind a label with its codebehind file, but it just lets me add an action. It does not give me the option to select outlet. I am following the documentation tutotial. Are you sure you are control+dragging your label into the header file (.h)? If you were control+dragging your label into the implementation file (.m), there would indeed only be the Action option available. INdeed it looks like you are dragging into the .m file not the .h file . 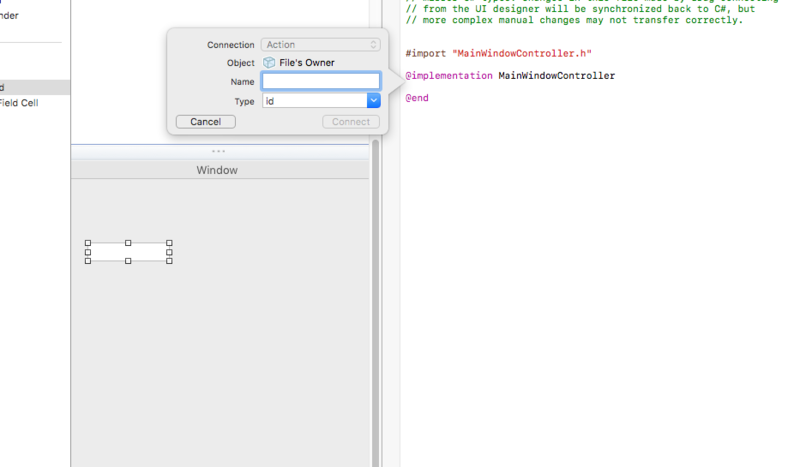 I can tell this because of the import statement #import "MainWindowController.h". A file does not need to import itself, so this must be the .m file (which does have to import its related .h file.